Six out of 10 was how England head coach Phil Neville rated his side’s performance against Brazil on Saturday afternoon, adding his “disappointment” at the chances missed and opportunities fluffed as England crawled over the line to a 1-0 victory. 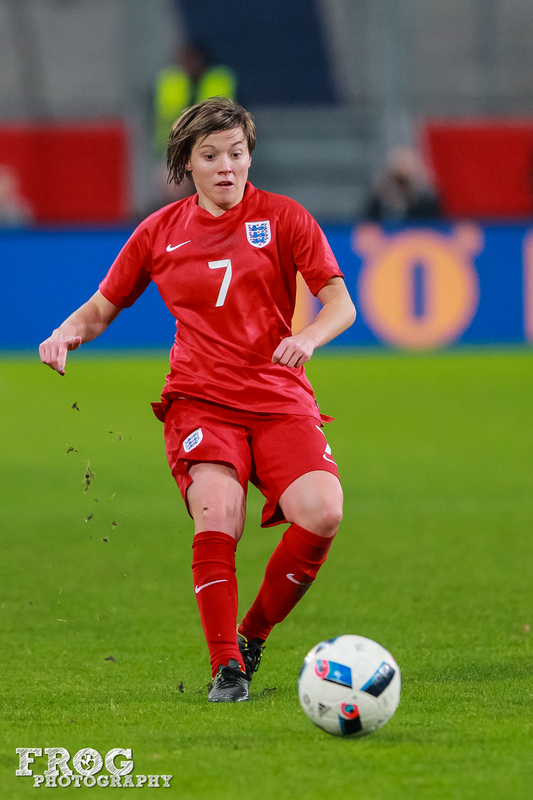 Fran Kirby’s second-minute header looked to be the spark for England to go and fill their boots — quite literally — against a team that despite their lofty status in the rankings has underwhelmed on the world stage for several years. It was a brutal day for the Brazilians who lost Marta, Bruna, and Monica to injury, the newly crowned world player of the year lasting just 20 minutes before a hamstring tweak saw her replaced on a gloomy day in Nottingham. Neville may have lamented England’s missed chances to kill the game and as he put it, “score three or four goals” but in reality it’s nothing new to those who have now watched England regularly frustrate in front of goal since long before the former England international himself took over a ship that very much needed steadying in January. Predecessor Mark Sampson favored a defense-first philosophy, ensuring England went into any game with half a chance of winning due to the defensive stability instilled during the course of his three-year term at the helm. Coming from a side in Bristol Academy that were underdogs in the league and often had to worry about keeping goals out when Sampson took charge, it’s hardly surprising to see a man who played for Manchester United under Sir Alex Ferguson turn England through a full 180 degrees into a team that wants to attack. A bold, brazen killing machine, the sides Neville played for under the lights at Old Trafford tore apart their opponents, scoring first and worrying about defending later. But why do a group of attackers who so regularly perform in the FA WSL or in leagues around Europe so often flounder in a shirt bearing the Three Lions? Few of England’s attackers could claim to have a good game though goal scorer Kirby was a shining light in her first real top-class performance in her new No. 10 role. Neville described her as “world class” both before and after the match and at times she lived up to the billing and at least seems to be showing glimmers of learning the role. Any good No. 10 needs to know when and if to break into the opposition box and Kirby regularly made darting runs into the box but England’s crossing after the second minute was often too wayward for the Chelsea forward. Granted, Formiga’s lack of tracking from midfield made Kirby’s life easier but she could easily have had several more on her own had England’s final ball not regularly let them down. Nikita Parris was the only other player who had a largely positive influence. She humiliated Camila on several occasions during the first half, putting in the perfect ball for the goal, and could have had a penalty had she not stayed on her feet after the left back made enough of a connection with the winger — known to go down easily in the FA WSL — to send her tumbling to the ground, but honesty prevailed on this occasion. Toni Duggan and Rachel Daly endured frustrating afternoons, the former hooked in the second half while the latter was typically industrious in her work ethic but struggled in front of goal, though she was denied late on by a brilliant Barbara save. England’s midfield three has been a more than contentious talking point during Neville’s time in charge, largely down to the constant placing of Kirby in it. But against Brazil Neville went bold, he went brazen, he went with not just Kirby but also Jordan Nobbs and Izzy Christiansen. No Keira Walsh and no Jill Scott, the latter ruled out through injury and it’s conceivable to imagine the Manchester City midfielder may have started if not for a knock picked up earlier this week. Not that Nobbs or Christiansen did anything wrong. Both were consistent; Nobbs trying to dictate from deep while Christiansen looked a little less at ease with her more defensive role but did play one delightful little dink over the top of the defense to play in Parris in the second half. The defense of Lucy Bronze, Steph Houghton, Millie Bright, and Alex Greenwood stood tall and predominantly untested but it’s all relative. Bronze was her usual self. Solid in defense and got forward at every opportunity while fellow full back Greenwood found herself a bit more reserved, so much so that her pinpoint cross for Daly late came from deep. Houghton was composed and while Bright had a few nervy moments on the ball the stellar partnership that has become England’s undoubted first choice center back pairing did the job required against a below-par Brazil side. Carly Telford’s kicking put England in danger a few times in the first half but upon making her first return to Meadow Lane since 2016, Telford came up big to deny Brazil an equalizer when Greenwood suddenly decided to pick out a blue shirt in the second half. It can get better, Neville admitted that himself and it’s tough to believe England will know anything more about their World Cup chances even after the next couple of friendlies. Sweden next month, like Brazil, have underwhelmed in recent years while the boss himself has admitted his disappointment that Australia, England’s next opponents on Tuesday, have decided not to trail Lydia Williams, Sam Kerr, and so on to the other side of the world. Even SheBelieves may leave unanswered questions. With France and Germany looking set not to return in 2019, England will once again face Brazil, plus Japan and hosts the United States, the latter the main test for Neville’s side leading up to the World Cup. Have England moved forward since the opening game of Neville’s reign where they so blissfully swatted aside France, leading 3-0 at the break and 4-0 in the second half with attacking move after attacking move? Have they even moved forward significantly from the 2015 World Cup? It’s still solid, it’s still industrious but it’s still lacking something, particularly goals in big games. Fara Williams even admitted England still trail some of the other top teams technically and it once again showed at times on Saturday. Neville has had a more than solid opening nine months. SheBelieves was far from a disaster despite an underwhelming ending and he has steered England successfully to the World Cup despite a stern challenge from neighbors Wales. He himself has admitted that like any manager he will be judged on the World Cup and that alone. Rightfully so. For now, everything else is just noise. A chance to experiment. It would be a surprise should the rather bold midfield three chosen for Brazil see the light together in a major World Cup match against a side better poised to upset the Lionesses than Vadão’s team were and it remains to be seen whether Kirby is indeed a long-term prospect in the No. 10 role or whether she’ll return to her forward role that has propelled her to such stardom with England. But go back three years and the one constant remains: England doesn’t take their chances, nor create them, against the better sides. The Lionesses fell to straight goalless defeats against the U.S., Canada, and France before going on to win bronze in 2015. Big questions were asked of Sampson after a 0-0 friendly against France leading up to the European Championships was followed by an underwhelming 1-1 draw at home to Italy, and England ultimately were sent home in another game they failed to score against the Netherlands. Despite a 100 k.p.h. start against France for Neville, those issues once again reared their heads against the U.S. and more so when England spluttered to a surprise 0-0 draw at home to Wales in April. England had their chances against Brazil. Parris had two big chances to score in one move in the first half before going on to endure a frustrating afternoon. Too often the final ball was, and has, been a letdown for players who regularly show a cutting edge for their clubs and it’s something Neville will surely be keen to address on Tuesday night, if not certainly by eight months tomorrow when the action kicks off in France.